Sometimes, simple packs a more powerful message than elaborate, and that's what I really hope this card conveys. This card on Pinterest was the inspiration when I sat down to make a bunch of Thank You cards. One of my (many) goals this year is to send more cards, especially ones that express my gratitude. I really must stock up on them so they will be handy when I need them, since I am blessed with so many people in my life to which I know I'll owe a debt of gratitude, in one way or another, this year. 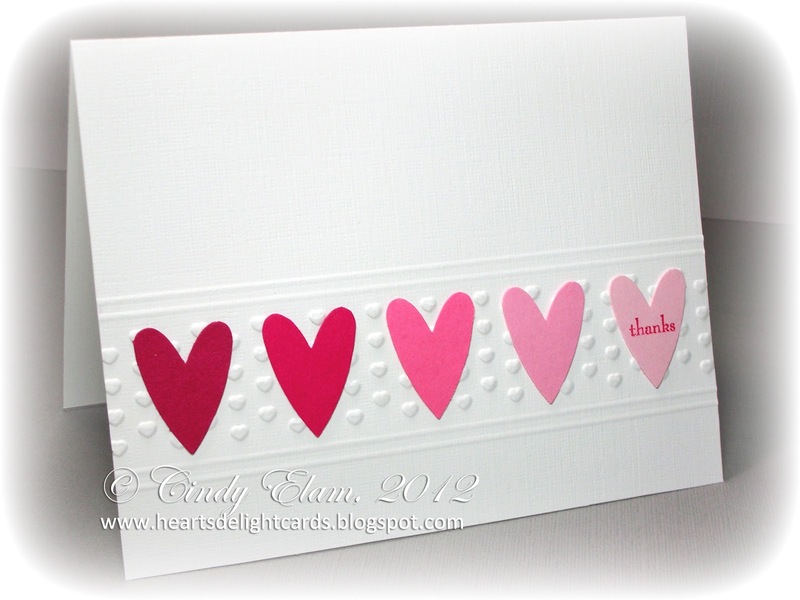 The name of the card is "Simply Thanks" because I used my Simply Scored Scoring Tool to highlight the embossed hearts from the Adorning Accents embossing folders set. Zip, zip and done! I LOVE creating cards (no surprise there, right?) but the problem in the past has been actually sending them, once they were made. Operation Write Home has helped find good homes for many of them, but I want to spread more RAK around. So don't be surprised if, out of the blue, you find a little something in your mailbox (that is, if I know your address, lol)! What an absolutely stunning card!! Love it! Cindy this may be simple but it is definitely very lovely. Sometimes a little says a whole lot. Operation Write Home gets a lot of the cards I make too. But I do love sending them to friends and family.